Louisville, KY (December 5, 2014) – Mercer County farmer James W. “Bill” Waggener has been named winner of Kentucky Farm Bureau’s (KFB) annual award for Distinguished Service to Farm Bureau. He was honored at the organization’s 95th annual meeting at the Galt House Hotel, receiving an engraved watch and a plaque. 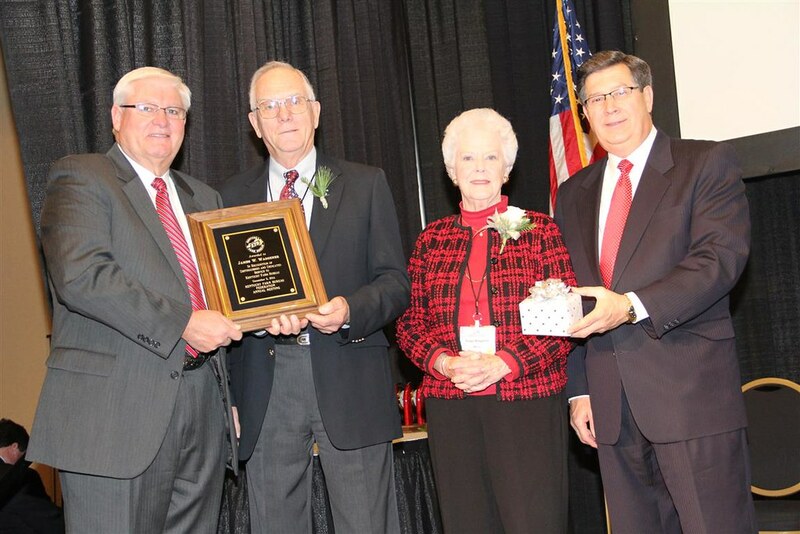 Bill Waggener (center left) along with his wife (center right) received the 2014 Distinguished Service to Farm Bureau award at the organization’s annual meeting, held in Louisville. The award was presented by David S. Beck, KFB Executive Vice President (right), and Mark Haney, KFB President (left). Waggener, 77, has been active with Mercer County Farm Bureau for 45 years. He served three terms as president and chaired the budget committee for 10 years. He currently serves on six of the county Farm Bureau’s committees, chairing two of them. He has been a voting delegate to KFB’s annual meeting for 35 years and has served on the state organization’s advisory committees for livestock marketing and education. He has attended five annual meetings of the American Farm Bureau Federation plus several of KFB’s Congressional Tours. A native of the Burgin community in Mercer County, Waggener has been farming for 56 years, producing tobacco, cattle and grain. He also had businesses spreading lime and hauling feed and cattle. He was the first farmer in the area to grow no-till corn and did so from a machine he designed with the Allis-Chambers Company. The University of Kentucky showcased that machine in “field day” events. Mercer County Farm Bureau leaders praise Waggener’s tireless dedication to both the organization and the community. In service to Mercer County Farm Bureau, Waggener played a key role in the 1997 opening of a modern office just south of Harrodsburg that serves both the Federation and the Insurance Agency. The county board, in fact, appointed Waggener to oversee the project. As county treasurer, he spearheaded an investment fund to prepare for future growth. Waggener also has championed youth organizations and agricultural education. He served 10 years on the Mercer County 4-H Council (including three years as president) and served FFA by recruiting former students to form an Alumni Association that would support a new FFA chapter at Burgin High School. He has also been involved with many “Farm-City Day” events to help unite rural and urban interests. His wife, Peggy, has long been active in Mercer County’s women’s program and with communications activities. The couple has two adult children. “His service has been most needed at the key times; conservative to protect us but yet the most visionary,” Mayo said. Cutline: Bill Waggener (center) received the 2014 Distinguished Service to Farm Bureau award at the organization’s annual meeting, held in Louisville. The award was presented by David S. Beck, KFB Executive Vice President (left), and Mark Haney, KFB President (right).